Posted on 9/23/2013 by Michael Management. 0 Comments. Take a look at the latest SAP trends in Training Magazine's September issue. The article, Soapbox: SAP Training Trends, contains current statistics from Michael Management Corporation's 2013 SAP Training Survey. With responses from 1,172 SAP Professionals, the survey provides insights into the perceptions and realities about the SAP training space. Specifically, one of the most significant findings of the survey is the trend away from traditional classroom training to online delivery methods. In fact, 60 percent of SAP professionals prefer to receive their SAP training online. 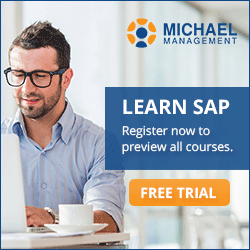 To download the complete Michael Management Corporation 2013 SAP training survey, please follow this link: http://www.michaelmanagement.com/survey. Michael Management Corporation (MMC) is an award-winning provider of hands-on SAP training simulations for global enterprises, government agencies and medium-sized businesses. MMC enables organizations to maximize business performance and minimize financial reporting errors through a combination of SAP eLearning content and SAP sandbox systems.